Hi There, as promised, here is a recap of what we recently covered in our email series. Enjoy! If you have taken the time to read the 20-minute guide, you will probably have discovered that there is a real opportunity to make deeper connections with our prospects without having to be all 'sales and sleaze'. This guide should set you up to make more meaningful human connections that help us get more business from the right people. The thing is that this is only the tip of the iceberg! In a few days, I am going to send you the first of a series of short emails that will give you a new way to go about presenting and positoning yourself and your business. The series will give you new ideas to help you look at your prospects from a fresh perspective. Did you manage to find the 20 minutes it takes to go through the elevator pitch guide? If so, you might have noticed that a great pitch should NOT be about yourself, but more about your audience. Discovering this was a turning point for how I changed the way I presented myself! Nobody enjoys the company of people who love to talk about themselves (that used to be me). Bragging about your abilities and your credentials will eventually evoke a 'yuck' feeling with your audience. The thing is that your skills are taken for granted. People expect you to know your stuff. That is why you are in business. What does matter is that people don't want to make mistakes when they pick you. They need to know that everything is going to be OK because in the end they will be held accountable for choosing you. They need to trust you! Trust is an emotion. You either feel it or you don't. It's difficult to plot on a chart. Trust can't be fabricated on demand. However, you can create the right conditions so it can flourish more quickly. Imagine you are on the other side of the world, immersed in a strange culture. Then you bump into someone from your hometown. You will probably feel a special connection to that person (unless of course one of you is some sort of fugitive who wants nothing to do with your 'homies'). This special bond also forms when we discover that we have personal things in common with others such as interests, struggles, beliefs, and so on. Those little details that unite us also open a fast-track towards trust. So how can we create this kind of connection with our prospects? I'm delighted to say that it is actually quite simple to do. It all comes down to asking one simple question. It takes the form of a 3-letter word that we already use dozens of time every day. Can you guess what it is? A couple of days ago, I left you hanging with a riddle about what the 3-letter word question is that will allow us to create the kind of environment where we can fast-track trust. In case you missed that email, here's a summary: If you want people's business, you first need to earn their trust. The right environment for trust to flourish is one where we have things that we care about that unite us. I hinted that there is a rather easy way to create that kind of environment the moment you meet someone. 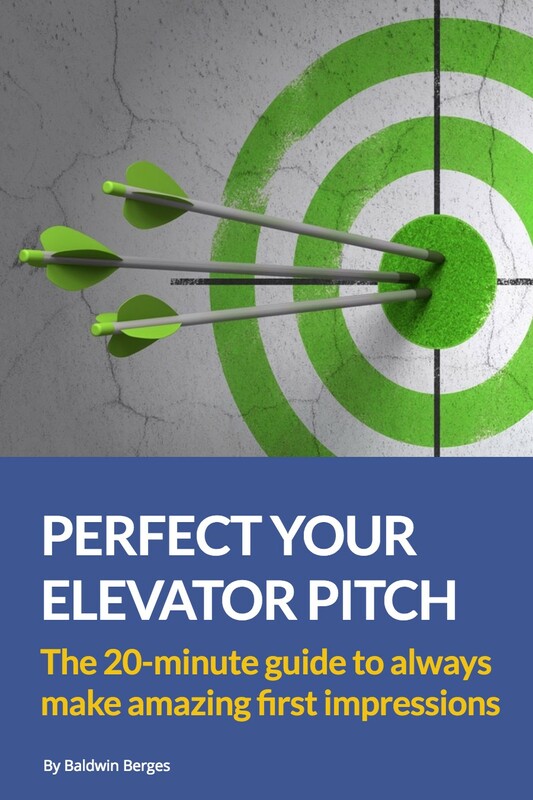 In my 20-minute guide 'Perfect Your Elevator Pitch', you may remember that in order to get someone's full attention, you need to tune into what they are really struggling with. When people see that you can describe exactly what they are feeling there will instantly be a special connection. All we need to do is find that message. More specifically, it is about using 'WHY' to drill to the core of your client's challenge. WHY should anyone want to work with us? As business development consultants, we are always looking to connect with people who need help to get more sales. This is the obvious answer, so much that talking about this won't help us stand out from the crowd very much. However, the answer to our first 'WHY' question already gives us something to work with: 'They need help to get more sales'. To do so, we could ask ourselves: WHY do they need help to get more sales? It is safe to assume that this is THE QUESTION that is keeping our ideal prospect awake at night. If the answer were clear, they would probably already be busy fixing things. But as business development consultants, we really want to connect with those prospects who are still trying to answer this question. Makes sense, right? OPENING: You know how we all need to have a great strategy to win more business in long sales cycles? CONFRONTATION: But often we struggle to get results and we are left wondering why our prospects aren't buying." RESOLUTION: We help businesses find out why this is happening and build systems and strategies to convert more prospects into clients. So, when our ideal prospects hear this message, they hear something like a 'dog whistle' that plays at a frequency that is loud and clear for them, it sounds exactly like that question that is nagging at them. Why not try to run a sequence of 'why' questions for yourself? It will help you get clarity about what that key message could be for your ideal client. It's quite simple and amazingly revealing! So far we have only been focusing on the message of the elevator pitch. The thing that once we get that part right, it can become much more than just something we say. If you really manage to get inside the mind of your ideal client, you can emancipate your message from the limitations of rational barriers because people will start feeling what you have to say rather than just hearing the words. Seriously, give it a go! Like I said at the end of the last email, the elevator pitch is only the first 'aperitif' of your message. It is important, but its purpose is only to trigger an appetite that needs to be fed. The reason why I like to start with the elevator pitch is because it is easy to execute. It is great 'target practice'. With the elevator pitch you get to test your message out in the real world without much risk or damage. Try to see it as a 'prototype' of your story. The words you use to describe yourself, calibrated by the response you get, will eventually lead you to the essence of your main message. I keep using the idea of a 'dog whistle'. Ever since a friend of mine brought it up a short while ago, it is still the most powerful metaphor I can think of to describe what I try to achieve with my work: To find that message that only the right people can hear and obsesses about. It's about putting in words what they are feeling. More importantly, to describe exactly what is really BUGGING them. This is the power of putting into words what people are feeling deep down inside. When you do that, they will not be able to stop paying attention to you! When people feel something, they take action. But make people think, and all they will do is go on thinking. Feeling and thinking are opposites. One is great for business and the other not so much. What side do you want to be on? Do you know that feeling when you go to the doctor with a problem and she asks all the right questions about the symptoms and then knows exactly what to do next? In a similar way, your message should become synonymous with the problem AND the solution. It's when you think "I promised to to get this thing delivered by the end of the week", chances are that your next thought will be about contacting DHL. After all, they have been drilling that message "we keep your promises" into your mind for many years. While driving out of town, my wife and I noticed a car wash with a distinctive sign that caught our attention. It said "American brushes: NO SCRATCHES!" A couple of weeks later, I mentioned to her that we should get the car cleaned and she immediately said, "Yes! Let's go to that place that leaves no scratches!" This is one of my favourite examples of being totally 'on-message'. We may not be consciously aware of it, but the autistic reptile that lives inside of us obsesses over getting the car scratched in a car wash. So, what should your key message be about? What is really bugging the people who would be better off by becoming your clients? I know, it's not easy to put your finger on it just like that. Even I still struggle with it. It's an ongoing quest. Start practicing. Your core message will improve and eventually you will nail it! Just remember that the message is not about you but all about the client! Understanding and embracing that detail will be a game changer. I promise! Hey, but wait a second! How do you come up with one message when we work with different clients and solve different problems for them!? Did your mind just ask that question? That is probably the most common challenge we all - myself included - struggle with when it comes to finding that golden message. This email is getting long again so let's cover that in the next one, ok? Picking up from where we left off, we need to find that one message that sounds loud and clear to our ideal client, even though it may not resonate with the rest of the world. Remember the reference to the dog whistle? This is about finding that frequency only our true potential clients can hear. And because we we have so much experience with what we do, this should be very simple. Right? It isn't that easy. Ironically, being so close to our craft is actually more of a problem because we know too much for our own good. You see, what is going in our heads is hardly ever the same as what our clients or prospects are thinking because our views are highly informed by a level of experience our client never acquired. Getting this kind of clarity is going to feel like an upgrade, so much that you are going to have learn how to handle it right! All right, that was the recap of the emails you may have missed. I hope this was helpful and I look forward to sharing more of these insights with you.